Many adults at a certain age start to feel like a family is next in timeline. A common fear in starting a family, though, is the idea that life stops at that point. Parenting is a great responsibility and can be very time-consuming. It is rewarding, however, the idea of not being able to do anything anymore may cause fear in some aspiring first-time-parents. Despite the added responsibility, fear not, traveling with a child doesn’t have to be difficult. We have created a guide to traveling with ease when done with a child. Traveling with a toddler is a whole different animal. Toddlers are gaining independence and have started to learn that they can make some decisions for themselves. If toddlers do not get their way they are more likely to state it with tantrums. This is why it’s important to keep them occupied or adjust the conditions of the flight so that they are more likely to sleep. Here are some tips to walk you through the process. When planning for your first flight with a child it’s important to note that there are some symptoms associated with vaccines. Some vaccines will cause some diaper overflow, rashes, and fevers. It’s important that vaccines are done well in advance of the flight to ensure the symptoms of the vaccine are well past before boarding a stuffy, high-pressure and lengthy flight. It is a good idea to have the vaccines done 1-2 weeks in advance. When packing for your flight, the first thing you may want to consider is taking a backpack rather than a suitcase or a carryon. The reason a backpack is handy is because this will free up your hands for active toddlers. Backpacks usually have side cup holders convenient for sippy cups and bottles. They also usually have side pockets for little snacks or wet wipes if needed. Wet wipes are important because you never know when there is going to be an accident or a spill. Children have all sorts of creative ways of causing something sticky to happen and happen everywhere, so having wet wipes on hand, specifically disinfecting ones, will help keep on the messes and help keep the child comfortable. Additionally, wiping their hands often will help avoid on-flight illnesses. Next up, snacks can help with one of two things. One is a distraction for the child. Having some easy goldfish on hand will help distract the child for a while as well as comfort them during the flight. It will also hopefully cause a little bit of drowsiness. Having filling snacks on hand will be a major asset to you during the flight. Another helpful travel accessory is the Trunki, the Trunki is a cute little traveling carry-on for children. The biggest benefit? It’s a ride-on. You can store all the child’s needs in the suitcase and when traveling through the airport the child can ride on the Trunki while you pull it with the lead included with. This way there is no worry of the child falling behind and there is no need to worry about getting to the terminal on time. The Trunki can be a little expensive for parents that don’t travel often. If something that may be used more frequently is of interest consider the Pockit Lightweight Stroller from gb. This stroller is the world’s smallest folding stroller and can fold up to roughly the size of a purse. It can be folded up, stored under an airline seat and is under 10 pounds in weight. This stroller will come in very handy when getting on and off the plane. It can also be used before, during and after your trip, eliminating the need for renting a stroller during your trip. Another item to consider is a toddler SOS kit. A child SOS kit is a little emergency kit that will help with any scraps and cuts along the way as well as any pain when flying. This little kit should include a topical antibiotic cream or ointment, an allergy or rash relief medication of some sort, some adhesive bandages and some sort of pain relief medicine approved for babies. Pain relief medication will both help any headaches and ear pressure issues when going into the air. It’s also to note here, that pressure when flying can upset any child so traveling with an ear infection isn’t recommended and should be avoided if possible. To keep ear pressure to a minimum it is important to keep the toddler’s jaw moving. Anything from food/water/pacifier will help with this. Make sure that just before the plane is about to take off that the child is distracted with one of these things to keep the jaw moving to help with the pressure the child will experience when getting into the sky. In flight there are a couple items to consider, one would be that the child will be bored and the child will get restless. 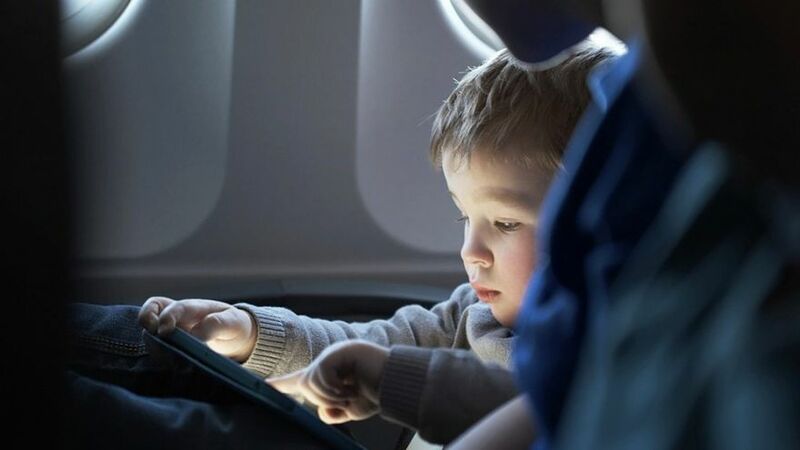 Before the flight, if a phone or a tablet is available, download some games for the child to play while in flight. Popular television service providers like Netflix allows you to pre-download content to watch when the device is not connected to the internet. 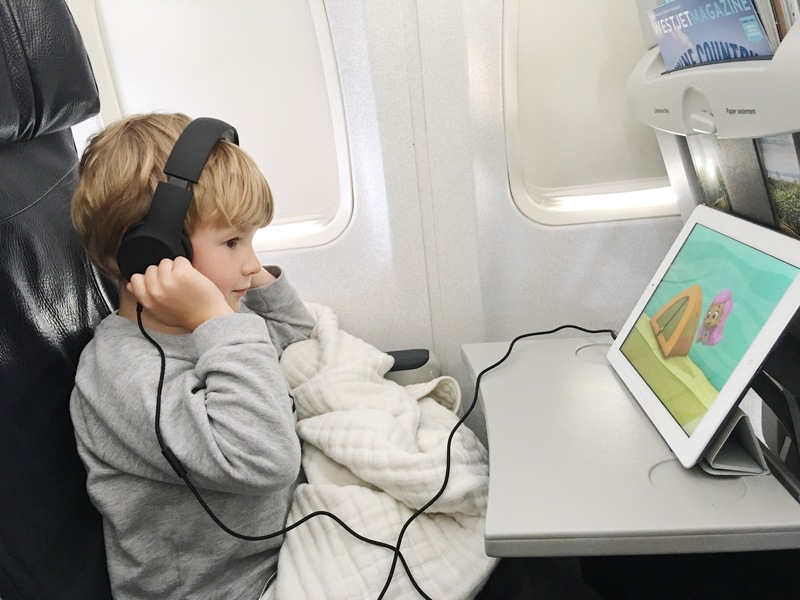 Consider downloading some children’s shows beforehand for the child to stay distracted with during the flight. If a phone or tablet is not available a coloring book will also help; using the tray table as a solid surface. When getting onto the flight always find out if there is one extra seat on the plane. Shuffling may be in order but even if there is one additional seat it will do you a whole world of good if you are able to seat the child next to you rather than having the child on your lap the entire flight. Checking ahead of time to see what the additional charges are for having an infant on the plane is also important. All travel carriers have different fees for children as well as what you can bring with you (like strollers) on the plane. 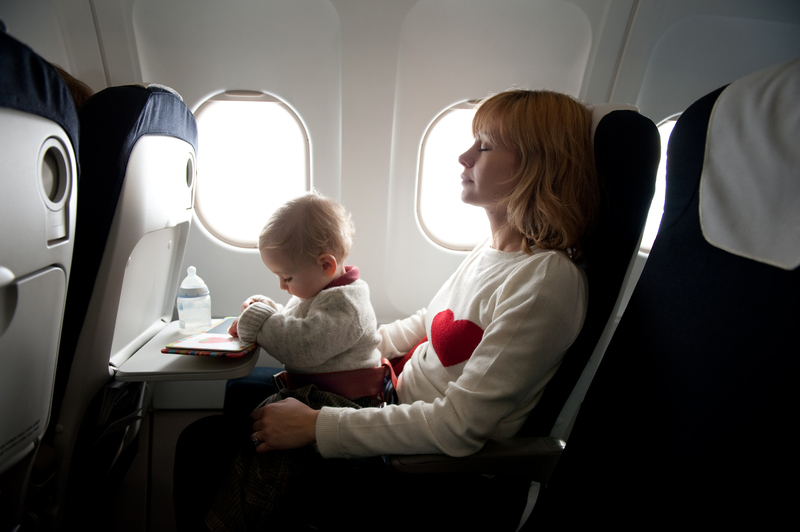 To avoid any surprises make sure that you know beforehand if there are extra fees involved with bringing your child (these fees are even if the child is sitting on your lap the entire flight). When getting onto the flight consider getting on as late as possible if no overhead room is required. 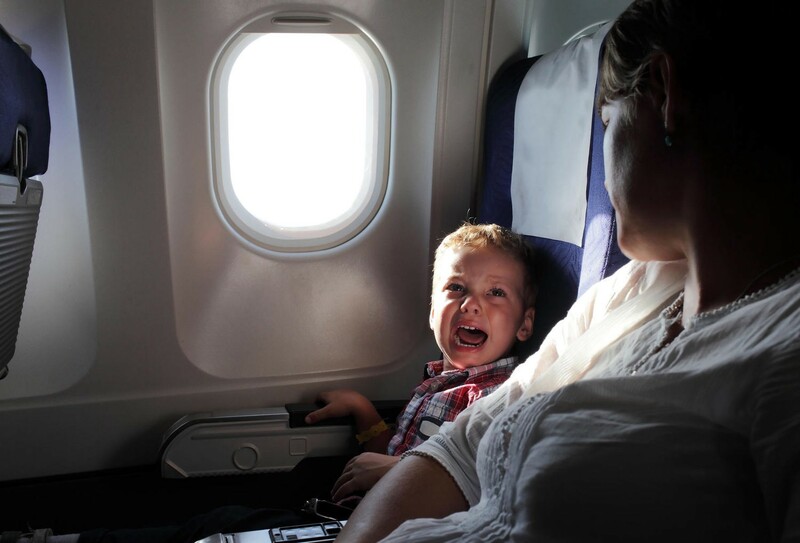 If it is, consider having your partner go on the plane first to ensure that overhead room is reserved and wait with the child as long as possible before getting on the flight. Some airports have little play areas for the child to hopefully tucker the child out before the flight so that they are more restful and hopefully sleeping during the flight. Also, consider flying during times the child usually sleeps. Red eyes may not seem appealing, however, the child is far more likely to sleep when they are usually sleeping and when it is dark in the cabin. A large scarf will also help keep the child cozy as well as aid in blocking out the light. If flying during the day make sure that every once in awhile you get up and roam the aisles from time to time to ensure that the child’s legs get a little bit of use. This will help keep down energy levels as well as avoid temper tantrums. If you’ve done everything that you can do and the child is still upset and making a lot of noise consider making little baggies with earplugs, a candy and a note apologizing for the screaming child to give to the other passengers on the plane. Though most of the time the screams are out of your control some passengers that don’t have children may not understand it and this may act as a way of creating understanding with the people around you. A little bit of awareness can go a long way. If you aren’t flying but rather driving or taking a bus, it is going to be much easier when traveling with a potty trained child. This way accidents are less likely and there will be fewer cleanups without a washer and dryer within easy access. If traveling with a child that is not potty trained consider getting a car seat that has moisture wicking and deodorizing fabrics to avoid discomfort and odor issues like the Mico Max 30 by Maxi-Cosi. 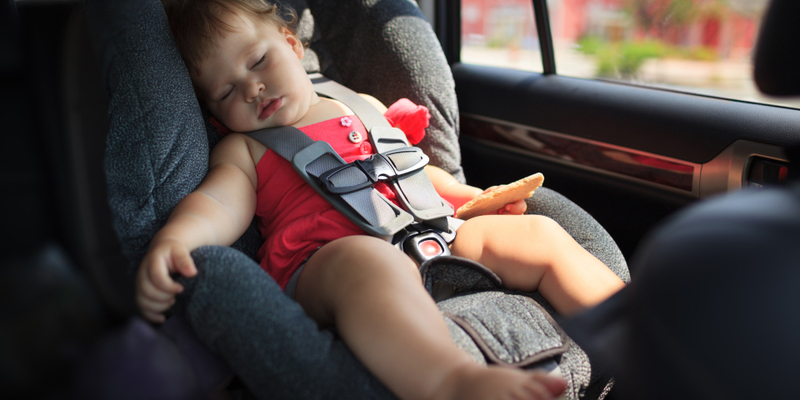 When choosing a car seat make sure that the car seat is comfortable. 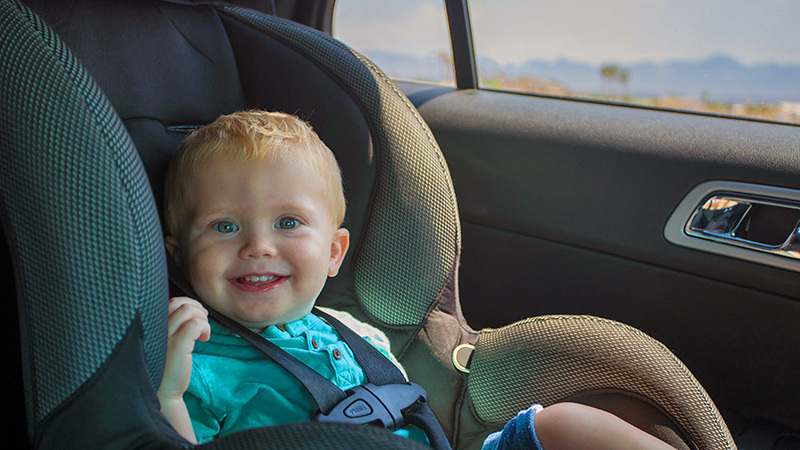 Spending less on a car seat may be desirable but spending a little extra and getting a good quality car seat will help with restless children and also help avoid both tantrums and frequent stops. We have a whole list of the top 10 car seats on the market today to help with this decision. When traveling around consider a backpack carrier for the child. This will help keep the child cool and avoid back problems for the parent (from carrying the child off-side on their hip). Additionally, this will enable the parent to visit places like museums or take a hike without having to worry about the child. Finally, another thing to consider but rarely actually done is to ensure that you are also taken care of. Make sure you are dressing comfortably, keeping yourself hydrated and also keeping rested. Your physical and mental health being neglected is not going to help anybody. We hope this guide was a helpful tool for getting you into the air or on the road with your little one with ease. Happy and safe travels!